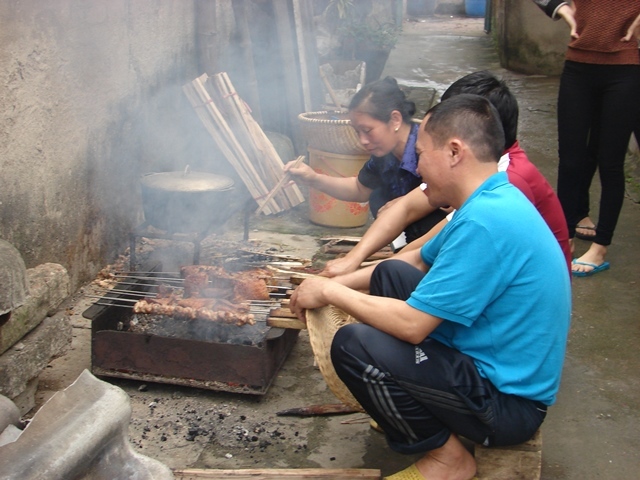 I have watched movies, documentaries, and read books about Vietnam but until I walked down the narrow road of a small, riverside Vietnamese village and could hear the pounding of metal and see the sparks fly did I really feel the pulse beat of the Vietnam people. Small villages along the Red River tend to focus on making one main item be it knives, noodles, bonsai trees, wood objects, bamboo products or rice paddy hats. They make the items the way they have for generations not just for a show-and-tell presentation created for tourists. In Tien Du village the ladies were making paddy hats called “Non La.” With our guide explaining every step in the process I learned that they start with palm leaves which are dried for about a week, flattened and then fashioned and sewn around a frame. It was impressive. One lady was 80 years old, sitting on a small block of wood, threading a needle and sewing on the leaves. Each lady specialized in one step of the process. They make about one dollar a day. They were working not selling their wares but we also visited a pottery-making village and where there were plenty of shops selling their pottery. A great place to pick up gifts/souvenirs. Besides learning about how products are made in the traditional manner I learned more about the culture. 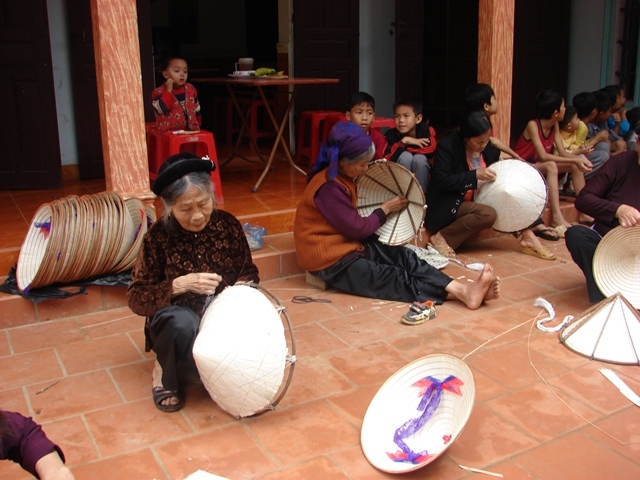 During a visit to Hung Lo Temple a local group performed a traditional folk song, “Hat Xoan.” “Hat Xoan” is seeking recognition as a world cultural heritage to be preserved. Xoan singing is believed to have been developed during the reign of the Hung Kings (2890 to 250 BC). It has been passed on within certain families for generations. I was impressed with the seriousness of the young boy leading the group. He was the grandson of the person who is currently the head of the group and some day it will be his job to preserve Hat Xoan and pass it on. Water puppets and Vietnam are synonymous. I have enjoyed the shows in Hanoi’s puppet theater but seeing the show in Thanh Ha village was special. 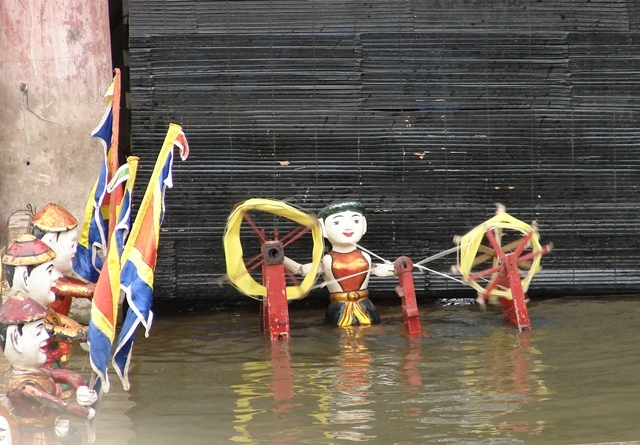 Water puppetry dates back to the 11th century when it originated in the Red River Delta villages like Thanh Ha. The puppeteers stand in waist-deep water hidden by a screen. They control the lacquered wooden puppets by an unseen bamboo rod so that the puppets appear to dance on water accompanied by drums, cymbals, and gongs. The puppet vignettes relate traditional folktale complete with a fire-breathing dragon plus day-to-day activities such as farming and fishing. The show was schedule for Pandaw guests but it drew the local people also, especially the children who took delight in the unexpected, free performance. At the end of one of the shore trips we were entertained on the wharf by a lion dance, an integral part of the Vietnamese New Year’s celebration. The Pandaw RV Angkor crew thinks of everything. They brought chairs from the vessel so we could enjoy the show in comfort. The lions, two people in one costume, are incredibly agile as they perform especially when the lions, one person on the shoulders of their partner, have to jump “battle” to get the lettuce that is held on a high spot. It is a traditional part of the dance as it portends good luck for the coming year. The cruise also included wonderful shore trips that showed off the amazing scenery of the area. The crew had arranged small boats to take us to Stork Island that protects the flora and fauna of the area. One morning we were bussed passed green rice paddies to the area called “Halong Bay on Land” where small wooden boats awaited. 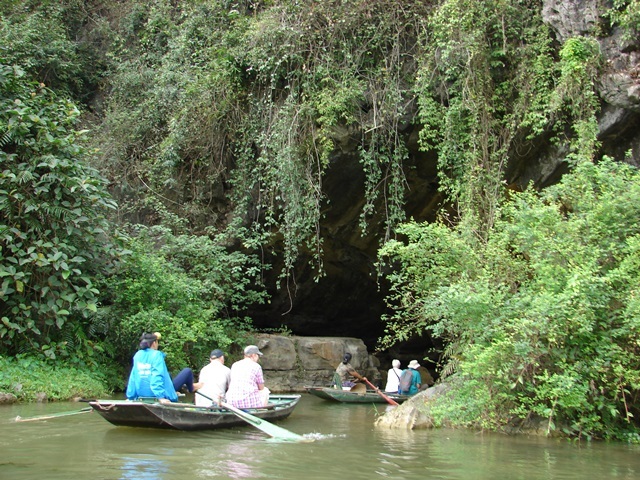 For an hour a lady rowed, using her feet, along the stream that passed by towering karst formation through two caves to a pond-like area where we stopped, I thought to give the rower a rest; not so, it was so she could give us a back massage! The cruise around Halong Bay was magical and, once again, the Pandaw crew arranged for a small boat trip in the area, through a cave, and to a place where we were in luck. We saw several of the endangered lemurs flitting from tree to tree. When we returned to the RV Angkor after a shore trip there were staff members waiting: one with a refreshing lemongrass scented towel, one with a refreshing fruit drink, and one to take our shoes and clean them. How’s that for service? Accommodations, staff and meals were five-star but attire is casual. 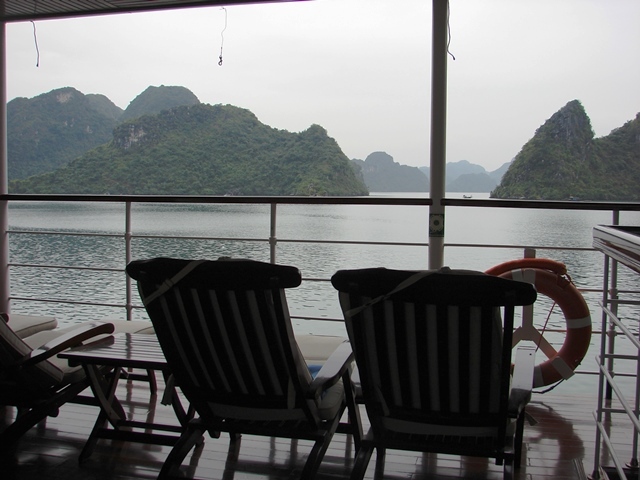 There were also onboard presentations: a cooking demonstration, musical presentations, cultural presentations, and in the evening, movies set in Vietnam. Before dinner one of the crew members explains the next day’s tour; along with evening turndown service there was a copy of the next day’s schedule. Pandaw guests get to see and experience things the average tourist does not. Pandaw is the pioneer in the Red River but they offer other cruises in Myanmar, Cambodia, and Laos. Pandaw has revived Burma’s Old Irrawaddy Flotilla Company. The RV Angkor like most of Pandaw’s vessels is hand-crafted and traditional in design but with all the modern conveniences, accommodations are large, there is even internet connection. The cruise is all-inclusive including the tip – I like that. The average number of passengers is usually in the mid-20s (maximum capcity is 32) most of whom are well-traveled. I was surprised to find that all but five passengers had been on more than one Pandaw cruise, it was the fifth trip for one couple. There is no better recommendation than that! If you go: For more information on any of Pandaw’s expeditions log on to http://www.pandaw.com or call 1-844-361-6281 toll free from North America, or email usa@pandaw.com. Pandaw offers pre- and post-trip extension trips. To visit Vietnam a visa is required.